Today guys we are looking at Where Shadows Slumber, a great puzzle game published by Game Revenant. I confess that I hadn’t previously played through the demo of Where Shadows Slumber that was available for the last year or two. Had I done so, I might have been prepared for the brutally violent story present in the release version of the game. 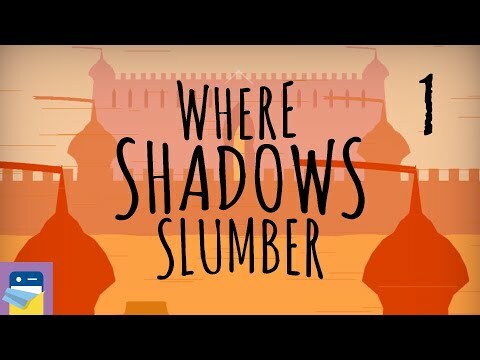 On its surface, Where Shadows Slumber can be described as Monument Valley (MV) with shadows, but just a little bit into it, it’s clear this is a much darker and sinister game and certainly not kid-friendly. As far as the puzzles are concerned, the shadows are a great addition to the formula, offering challenges on the level of Forgotten Shores, and even beyond. Despite some technical issues and the occasional frustrating or tedious puzzle, this is a solid choice for any puzzle fans. And now let`s get deeper into this great puzzle game and see what more she has to offer. The game starts off with a man named Obe, who looks like a Jewish Stay Puft Marshmallow Man, taking a stroll through a forest as some menacing eyes lurk from the shadows. Out of nowhere, a lantern falls from the sky, so he picks it up and continues on his way. Soon enough he learns that he can change his environment using the shadows cast from the light of the lantern. For instance, walking behind a pillar to cast a shadow over a gap might create a bridge. Or a button that didn’t exist before is now visible after passing a shadow over the area. He starts to get a bit attached to this lantern, so much so that when three wild animals attack him over it, he tries to fight them. In fact, it turns out he’s willing to do just about anything to hold onto this lantern. It’s kind of like The One Ring from The Lord of the Rings. Only darker and more violent.